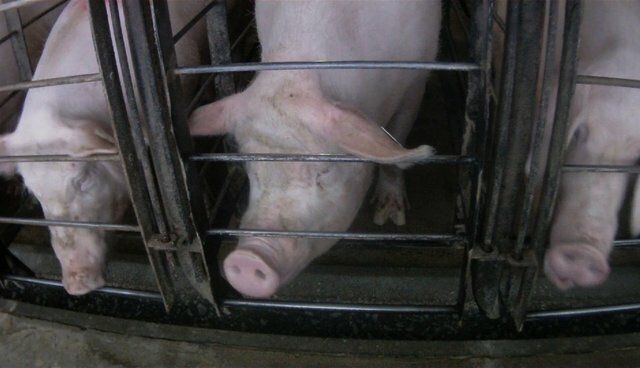 Pigs in a research barn squealed with every step they took, their movements accompanied by intense pain and discomfort. A pork producer opened his transport truck to find 10 to 12 pigs dead after each journey. And in one slaughterhouse, documented by animal behavior expert Dr. Temple Grandin, "the pigs were so weak they couldn't walk. They had five or six people just dedicated to handling the lame pigs." All of these incidents were "adverse events" suffered by pigs after they were fed ractopamine, a rampantly used growth-promoting drug that has triggered more reported incidents of negative side effects – more than 160,000 and counting – than any other animal drug on the market. Banned in the European Union, Russia and China – which is, in itself, telling, given that the latter two nations are not known for rigor in food safety – the Food and Drug Administration (FDA) approved ractopamine for use in pigs after reviewing only one questionable study on the direct effect of its exposure to humans. Consistent with human health concerns, ractopamine residues have, nevertheless, been found in one in five samples of fresh pork in supermarkets, according to the magazine Consumer Reports. Despite these deeply troubling statistics, ractopamine is fed to a majority of American pigs, as well as cows and turkeys, to spur rapid lean muscle growth. Last Thursday, The HSUS, the United Farm Workers of America and the Animal Legal Defense Fund filed a lawsuit challenging the FDA's approval of ractopamine and ractopamine combination drugs (including combinations with medically important antibiotics such as tylosin). The Center for Food Safety, the Sierra Club, and the Center for Biological Diversity filed a companion lawsuit the same day. The two cases argue that the FDA has failed to comply with the National Environmental Policy Act, which requires that an agency consider the health, safety and environmental consequences of its actions. The FDA has never conducted a single independent study into the safety, environmental or animal welfare effects of ractopamine. The collaboration with the United Farm Workers of America is a vivid reminder that ractopamine affects not just animals and consumers but also workers. So often we find that where there are problems for animals, there are also troubles or hazards for workers. Farmworkers have reported becoming violently ill after exposure to this toxic compound. And since the drug can make animals more aggressive, it puts farmworkers in greater danger, too. We're also highlighting the dangers of ractopamine to the highly vulnerable ecosystems around factory farms. Pigs, cows and turkeys excrete most of the ractopamine fed to them into their manure, which is often dumped onto fields, potentially introducing over a million pounds of the drug per year into the environment. Once in the environment, it can pollute waterways and harm plants and aquatic invertebrates, including 98 species of threatened and endangered aquatic invertebrates and plants that we've identified as having critical habitat in areas where ractopamine is used. The fact that the FDA approved ractopamine without considering all of these risks shows how broken our veterinary drug approval system is. Just as a staggering 80 percent of antibiotics used in America are now fed to farm animals for non-therapeutic reasons, hormones and growth-promoting drugs are also commonplace on factory farms, and, as this lawsuit shows, they are often used in tandem. The FDA should start pulling these risk-laden and harmful drugs off the market, and ractopamine is a perfect place to start. There is no animal welfare justification for using ractopamine, which causes pigs to overheat, collapse and suffer in transport – the pork industry uses the drug solely to boost growth rates and increase profits. If the National Pork Producers Council is serious about treating these animals as more than just widgets and units of production, it should urge America's pork producers to stop using the drug immediately. Until ractopamine use is eliminated, consumers should stop buying these risky pork products. In a path-breaking report in 2008, the Pew Commission on Industrial Farm Animal Production spoke of "an agro-industrial complex" exerting immense control over regulatory agencies and Congress to the detriment of animals, consumers and the environment. The use of ractopamine is an ugly reminder of the power of that agro-industrial complex, and how good decision-making is subordinated to the profit-making of the pharmaceutical lobby and the factory farming industry. When we've fallen behind China and Russia on these issues, you know there's something terribly amiss in our oversight system and our policy-making processes.